Want to build your own website but don’t know how to start!! Don’t worry, here we will tell how to create a (FREE!!) website step by step. Before opening any website, it is very much important to set a clear goal. So let’s start our discussion with few initial questions. 1) What kind of website you want to open (educational, commercial, music, social…)? 2) How much space do you need for your website? will mainly have videos or images, it needs more space than just text based website. 3) What would be the content type (text/picture/music/video)? Decide the percentage of every content type. 5) Do you want custom email id? (Suppose, owner of the website www.lovemypet.com would like to have custom email id like [email protected]) Also how many custom email id is required for you? 6) Do you need any mysql/php server deployment/maintenance for you website? 7) Most important, budget for your website? You may think that just now we told free website, then why do we need budget here. Well, if you want a professional name for your website, then you have buy domain name like techonestop.com . But if you just want to start your own website, which mainly contains text articles and does not require any custom email id or server maintenance, then better to start with blogger or WordPress. It is completely free of cost. After that just buy the domain name and integrate it with blogger or WordPress website which will give your website a professional name. It will cost you few bucks only but if you want our own web hosting mechanism, more space to store contents like music, video or custom email ids, then you have to pay more. Here we will discuss how to get a website with professional name spending nothing or very few bucks. High Level Idea: Use Blogger or WordPress which will give you a platform to write articles, free templates for website, free widgets and many more and then integrate it with actual domain name. Here we will use blogger. 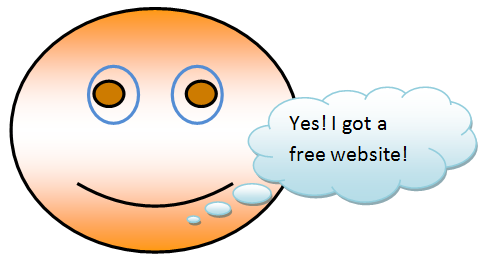 Lets see in details how to build a free website. As we are using blogger here, we have to have Google account to get blogger administration window. If you already have Google account. you can use it otherwise open a new Google account. We will use this Google account to login into blogger.com. Once you are logged into blogger, click on the ‘New Blog’ button to create a new blog. One blogger account can have up to 100 blogs. In the popup window, give the title of your blog and in the address field, put your blog name. Its url will be sub-domain of blogger. Suppose, if title is like ‘Love My Pet’, then address could be lovemypet.blogspot.com. Initially pick any template for your website, given by blogger, later we can change it. Now click on ‘Create Blog’ and check your blog has been listed in your blogger account or not. Once your blog is created successfully, either click on ‘View Blog’ button or give the blog address url in address bar of any browser. Your blog will be up and running just like any another website. Only difference, it will have blogspot.com sub-domain. Now our next step is to give a proper name like www.lovemypet.com so that it looks like professional website. You can write posts, change templates/color/font size of your blog, add navigation menu bar. We will discuss these in next post. Now we will change the name of our website. To do this, we have to buy domain name so that our blog looks like www.lovemypet.com. What is domain? Domain is nothing but the address url of a website. Without proper domain name, we cannot open any website. Now one domain name can have sub domain also like blogger.com is a domain name but when we create our blog under blogger.com, we get address like mywebsite.blogger.com which is the sub-domain of parent one. To buy our own custom domain, we have to spend few bucks. Also price varies from domain to domain, like if you buy generic domain name like .com, .info, .org then you need to pay more. But if you buy country level domain like .in, .us, .uk then you pay less. There are many companies who provide domain names in cheaper rate like godaddy, register, bigrock, yahoo. Visit any of these sites and search for your domain name availability. Suppose Lovemypet.com is already taken by someone else, then you can either change the name like lovepet.com or if other domain extension (like lovemypet.org/lovemypet.co.in) is available, pick up any. So once you decide your website name, register and buy the domain. Before buying domain name, don’t forget to compare price in various websites as price may differ from one company to another. You can see various buying option like only hosting, hosting with server maintenance and email id. For the time being you can pick up only hosting option. After registration, you will get code which needs to integrate with your blog. It may take some time to get the code. a) Goto DNS Management of your domain name. Here you have to create 4 different ‘A’ records of domain by using 4 different IP addresses. b) After creating 4 different ‘A’ records, it’s time to set ‘Cname’ for domain. To do this, go to ‘Cname’ records and click on Add ‘C’ name record. www in name box, put value ghg.google.com and TTL 28000 and save the ‘Cname’ record. Once you are done with ‘Cname’ configuration in your hosting website, we have to change few settings in our blogger account as well. So, login into blogger and select the blog for which you want to set up ‘Cname’. Go to ‘Settings’ > Basic > Publishing Blog Address > Add custom Domain name and in Advance settings, type your domain name. Add a new ‘Cname’ here using verification code. Put the first code in ‘Name, Label or Host’ field, second code in the ‘Destination, target or Points to’ field and add TTL as 28000. That’s all to give your blog a pro name. It may take few hours to do DNS settings and blog verification. Also the above steps, given in Step 3 and 4 may vary from one hosting company to another but mostly they are same. You can refer ‘how to setup’ docs, available in any hosting service provider website. Also you can spend some time for decoration of your website. To do this, login into blogger account and select your blog. Go to setting tab and pick most suitable template for your website. Change the font color, size and background color in blogger provided interactive designer pane. If you want, add some custom HTML/CSS code or add gadgets. You can get many free templates over the net and integrate it with your blogger if you are not satisfied with templates, provided by blogger. That’s all to have your own website. How can you make it completely free if you want a pro name for your website? 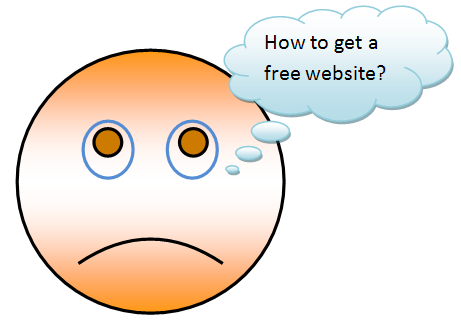 Let me tell you this how you can get website free of cost. You already know that one can have any number of blog completely free of cost. Now if you don’t want to pay a single penny to buy domain name, then go for domain co.nr. It’s completely free and don’t need to pay a single penny. To get this, visit www.freedomain.co.nr and register, this will give you a free domain name. Follow remaining steps to integrate you blog with .co.nr domain. Do you have any question on how to create a free website? Then please write us. Sharing is caring, so please share it with your friends.To get more updates on recent activities, follow ‘TechOneStop‘ on Facebook/Twitter/LinkedIn.